This recipe is from Ina Garten's Barefoot Contessa At Home cookbook. 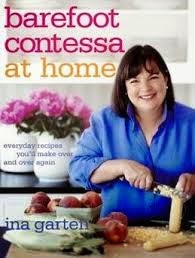 I have made several great dishes and desserts from this cookbook. These bars are like eating a peanut butter and jelly without the bread. The bottom layer is a peanut butter shortbread with a gooey jelly middle layer and a peanut buttery topping with roasted peanuts. I made half with strawberry jelly and the other with grape jelly. You can use your favorite jelly or jam. Preheat oven to 350 degrees. Spray a 9x13 inch baking pan with non-stick cooking spray. Line with parchment paper, leaving a 1/2 inch overhang on each end. Spray parchment paper with non-stick cooking spray. This will help you lift it out of the pan before cutting into bars. In a large stand mixer bowl, cream the butter and sugar on medium speed until light yellow, about 2 minutes. Add the vanilla, eggs, and peanut butter and mix until well combined. In a small bowl, sift together the flour, baking powder, and salt. Add the flour mixture to the peanut butter mixture and mix just until combined. Spread 2/3 of the dough into the prepared pan and use your hands to spread it out evenly. Spread the jelly or jam evenly over the dough. Drop small clumps of the remaining dough evenly over the jam. The dough will spread when it bakes. Sprinkle with the chopped peanuts. Bake for 40-45 minutes, or until golden brown. Let cool in the pan on a wire rack. Lift out of the pan using the parchment paper and cut into bars. Enjoy! Yum! I have seen Ina make these and they sounded delicious! Good to know they taste so good too. So nice that you can use the flavor jam that you like, and they have to tase better than anything store bought! I think I have seen this recipe on her show, and they looked good then! They look great now too! Would love to have these in the house right now! Ohhh yes..I have made these before. They are THE BOMB!!! Thank you so much for stopping by and linking your wonderful PB&J bars with Ina's Garden. Have a lovely weekend! Simply loved these PB&J bars when I made them for Ina's Garden. Yours look delicious! Thanks for linking. These look yummy! Love the salted peanuts on the top! These look and sound delicious! Definitely a combination that takes me back to my childhood! Thanks for sharing on Sweet Indulgences Sunday. I've made these before and we loved them! Yours look gorgeous with the salted peanuts on top! I made this recipe also and it was so special. I am glad you linked it to Ina's Garden. It gave me the desire to make it again.